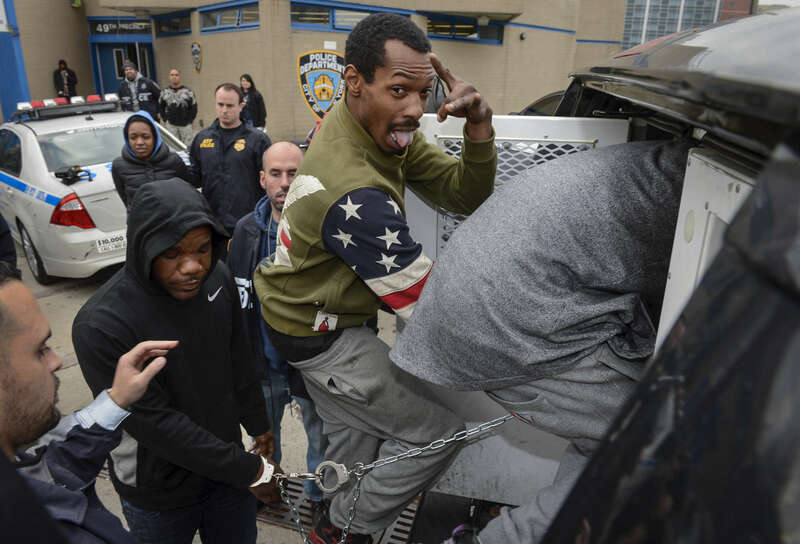 Dozens of accused gang members were perp walked chain gang style out of the the 49th Precinct located at 2121 Eastchester Road in the Bronx on Wednesday, December 9, 2015. New York Police Department and the FBI are charging the members with illegal weapons possession, saying that they have terrorized their neighborhood with a series of shootings. The twenty one members of the Young Gunnaz — or YGz — and eighteen Park gangs were handcuffed during a 6 a.m. raid in the Patterson Houses in Mott Haven, law enforcement officials said. Charges being brought against them include: three murders, five attempted murders, 30 nonfatal shootings, racketeering, drug dealing, and a litany of gun counts. Two guns were seized during the busts.